Once you sit behind the wheel you won’t want to leave. The helm is a comfortable, stylish space full of natural light and adjustable ventilation options. The ergonomic dash, wheel and throttle. The clever passenger bench houses all your cooking needs. 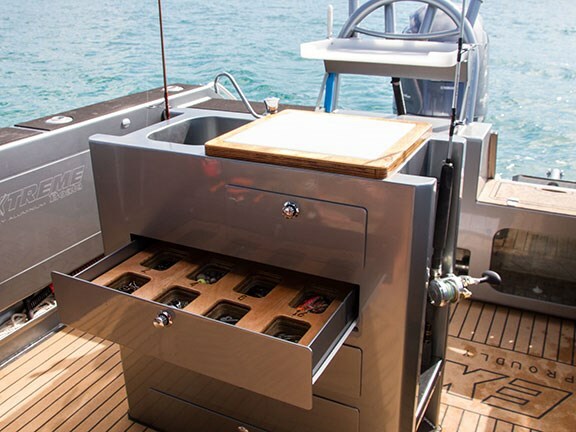 The centre console fishing unit provides plenty of tucked-away storage space as well as a second bait board and freshwater sink – a very nice option for serious fishos who like to stay organised. The swim platform is lined with comfortable compressed cork. It’s easy to walk and fish between the transom and the engine. It’s a boat equally at home mooching the shallows or looking for a dive spot as it is blasting over the horizon. 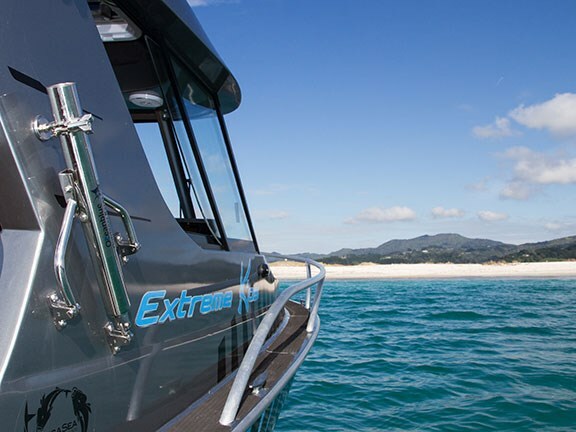 Chris Lorigan recently took the helm of the Extreme 700 Profisher. Here he explains how he felt about driving a $158,000 custom craft. 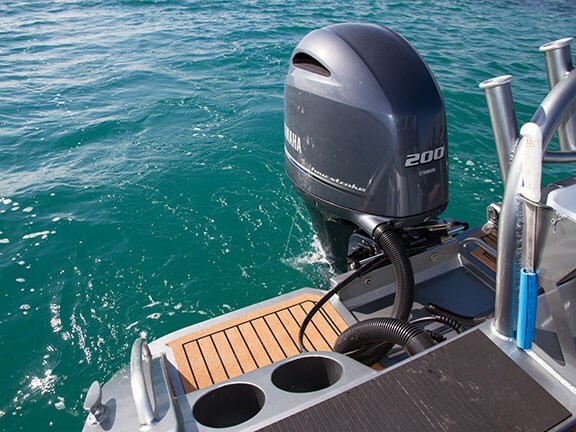 I leaned heavily on the fly-by-wire throttle and the boat bolted – its fantastic Yamaha F200 four-stroke fluently getting us up on the plane and powering us quickly to 38kts. I buttoned off a bit and tried a few tight manoeuvres, and the boat did what it was told. The hydraulic steering is light and directional and the boat tracks perfectly with that sports car-on-water feel that inspires confidence. Due to the hull's upright sides, there's a lot of wet area under chines, which makes it very stable and comfortable. At wide open throttle the ride was pretty much flawless, with the wide chine offering good stability and turning spray away for a dry cockpit. The occasional tweak of the trim tabs – standard on all Extreme hardtops and very handy on any deep-vee hull – kept her on the level. The only down side was that water conditions weren't worse. Aside from diving, this boat is set up to cover two bases: family time and fishing time. It's regularly used for overnighting, cruising and water sports for the Miller clan. But the innovative, practical setup will have an angler's mouth watering. From the live-bait tank to the twin tuna tubes, outriggers and impressive stability at rest, the 700 Profisher will help you fill the bins. You'll find ample rod storage in the gunwales, the rocket launcher, and in the transom arch aft of the self-draining plastic bait board. 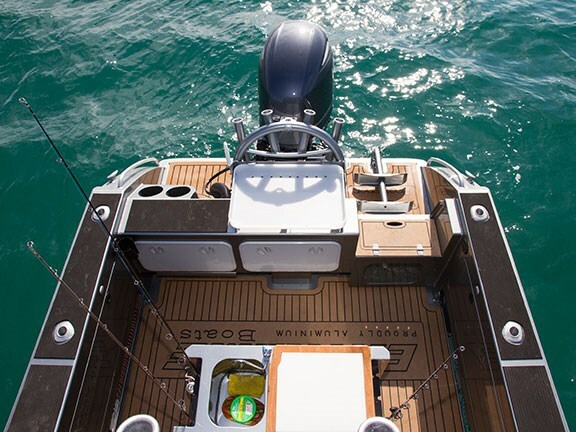 The covered side shelves offer room for even more, plus gaffs and nets – with the long port-side shelves extending forward under the hardtop for longer rods. There's room for more rods in the centre bench/console fishing unit, too. their work. The unit has loads of storage drawers and cupboards, with tackle neatly tucked away above pots and pans and other essentials. 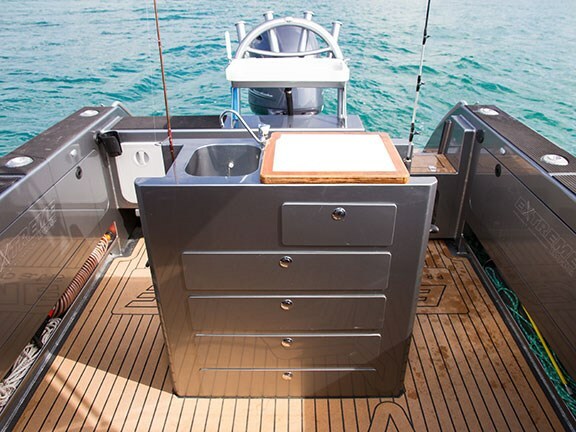 The console has a second bait board and freshwater sink, and is a very nice option that allows serious fishos to remain organised and in charge. 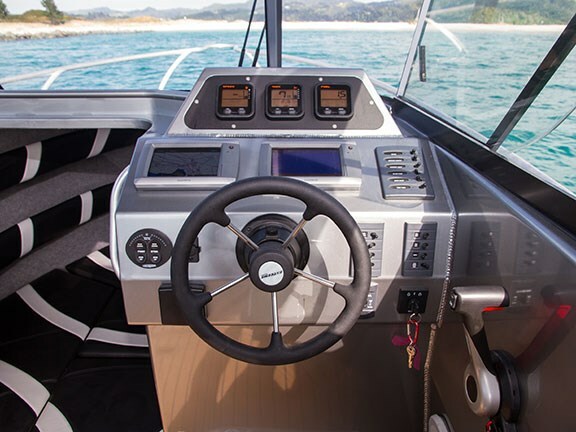 The helm position and skipper's seat are very comfortable, while the dash, wheel and throttle are the epitome of ergonomic design. Twin hatches in the roof provide natural light and will open for ventilation – one to the front and one to the back – to account for conditions. There are plenty of solid, well-placed handrails under the hardtop, which I was pleased to see considering the amount of times you have to cast about in boats looking for something to grab when conditions change or the skipper decides to play it fast and loose at pace. The passenger seat is a clever and unusual unit: it's a padded bench installed side-on so two people can sit opposite the skipper. This provides an open, social setting, which is perfect for families, but it's more than just a comfy seat: housed within the bench is a cooker, a fridge and large storage drawers. A third occupant can sit on the more traditional bucket-type seat that adjoins the bench. 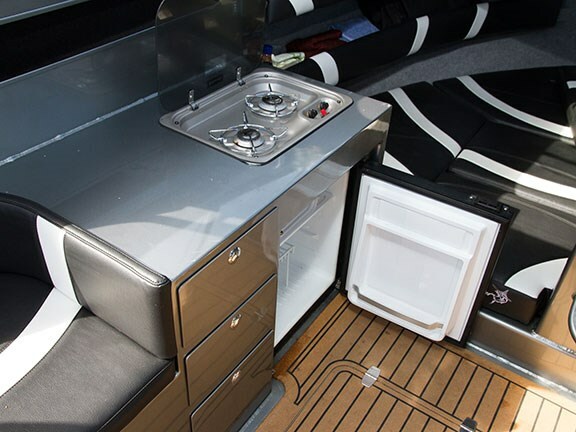 The spacious cabin can sleep three in comfort and, like the rest of the boat, offers plenty of storage. An electric macerating toilet is tucked under the centre bunk infill and a curtain offers the required privacy. 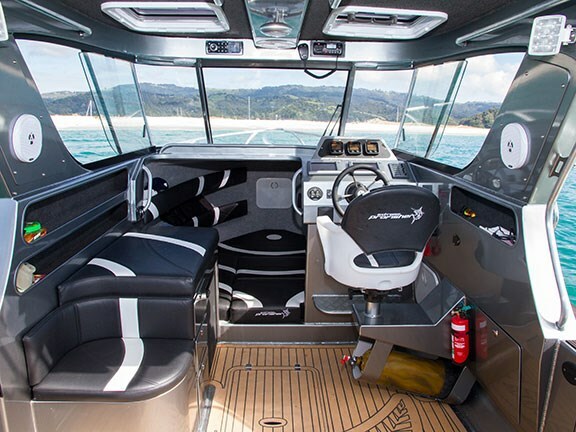 There's well-positioned LED lighting in the cabin, and every space is taken care of – there's even a light above the transom bait board if your mission takes you past sunset. 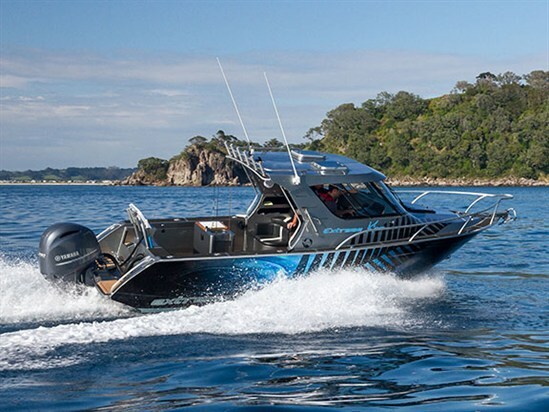 This classy seven-metre boat is absolutely packed with features and performs so well I'd have to consider it if I was after a custom build for fishing and diving. I felt right at home as soon as I took control, and I'd recommend you try it out if this is your area of the market. Extreme 70 Profisher with Yamaha F200 four-stroke outboard. 3POB. (WOT 5800rpm for 39kt.) Light chop.